Taxfile’s May Newsletter is Now Live! Check out Taxfile’s latest newsletter which includes important tax and accountancy-related news that might affect you. You can read the newsletter in full here. If you need help with any of the issues raised, simply get in touch and we’ll be able to help. Are you a construction worker near Battersea, London SW8? We can help sub-contractors, contractors and limited companies with their tax affairs and accountancy requirements. Sub-contractor in the CIS Scheme? Let Taxfile claim your tax rebate for you! Tax refunds are quick and easy with Taxfile. Informative CIS tax postcards to share at work. Multi-lingual staff – our staff speak anything from English to Arabic, Dari, Dutch, French, Hungarian, Pashto, Polish and Russian. Great if English is not your forté! Avoid a late filing penalty of £10 every day if your tax return has still not been filed. Taxfile can help minimise your fine! Refer a friend to Taxfile and save money! Free tax enquiry ‘fee protection’ insurance. This could save you hundreds if HMRC launch a tax inquiry against you, and it’s free for all Taxfile clients (terms apply). Check out our many 5 star customer testimonials! Call into any of our branches where our friendly team will be happy to help with any tax or accountancy-related matters. We have branches in Battersea SW8, Tulse Hill and Dulwich in SE21, Exeter and Plymouth (click any of the bold links for more details and contact information). Call the Battersea branch on 020 7821 9444 or, alternatively, call our London head office on 020 8761 8000 for help with any tax or accountancy-related matter, no matter where you are. We’ll be delighted to help. https://www.taxfile.london/wp-content/uploads/2018/05/Battersea-newsletter-image.jpg 390 833 Mark https://www.taxfile.london/wp-content/uploads/2018/04/TaxfileBattersea.png Mark2018-05-18 18:31:502018-11-23 18:32:17Taxfile's May Newsletter is Now Live! 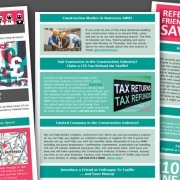 Taxfile helps CIS sub-contractors in South West London including Battersea, Clapham, Pimlico, Vauxhall, Balham, South Lambeth, Earlsfield, Southfields, Wandsworth, Chelsea, Fulham & beyond.